You are at:Home»Herbs»Acorus Calamus Linn. Latin name : Acorus calamus Linn. Description : The dried rhizomes possess acrid, analgesic, anthelmintic, anticonvulsant, antiinflammatory, antispasmodic, antitussive, aphrodisiac, aromatic, bitter, brain tonic, carminative, decongestant, demulcent, diaphoretic, digestive, diuretic, emetic, emmenagogue, expectorant, febrifuge, hypotensive, laxative, nervine, rejuvenative, sedative, sialagogue, stimulant, stomachic, sudorific, thermogenic and tonic properties. In Ayurvedic medicine it is valued as a “rejuvenator” for the brain and nervous system. Useful for dyspeptic disorders, gastritis, ulcers and for expelling gasses, stomach cramps, flatulence and griping pains. 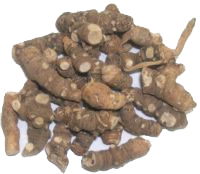 Reduces fever, promotes menstrual flow and mucous secretions from the bronchial tubes. It has an antihistamine like effect on hay fever and colds. It is also beneficial in depression, hysteria, insanity, neuralgia, asthma, bronchitis, cough, tuberculosi and irritation of the throat. It also aids in recovery from stroke and detoxification from anesthetics. Given to children to enhance their intelligence. Externally useful in chronic rheumatism and paralysed limbs. Recommended Dosage : 60-120 mg. powder. 1 to 3 g powder for inducing vomiting. Contraindication : Pregnant and nursing women should not use Sweet Flag, as it is considered a uterine stimulant. Overuse (many times the recommended dosage) should be avoided, as it may cause vomiting and further serious problems.